I went to the pharmacy today, the price of Iron there is pretty expensive. 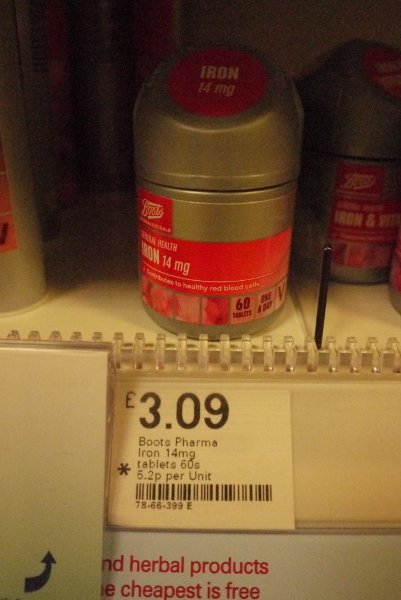 Expensive Iron, 5.2 p per 14 mg.
5.2 pence per 14 mg tablet. That means the price per kg is £371,000 (371 thousand pounds), or 3.7 million pounds per tonne (3.7 M£/tonne). This is amazing, the usual price of steel is more like 600 pounds per tonne, and around 1.5 trillion tonnes (1,510,222,000 tonnes) (1.5 Gigatonnes) of steel are produced annually. It seems like the steel industry should be selling this steel for 1000 times more. That would be a total of £5.6 &times 1015 or 5.6 P£ or 5.6 petapounds (I don’t know the financial term £5.6 million billion or 5.6 thousand trillion or 105 times world GDP). Compared to the human body, the average amount of iron is about 3.5 g per person. That means we need 250 of these tablets to replace the iron in our body, at a cost of 13 pounds.